Even though I’m Canadian, I don’t care for the cold Winter months. Especially the month of March when the sky is constantly gray, the remnants of filthy snow linger, one still has to bundle up from the cold air, and the short days with dark evenings of daylight savings are too depressing. During those times I look at this photograph by my friend Betsy Cullen, “The Pool, 1992, Mexico” and it takes me there—it takes me away. 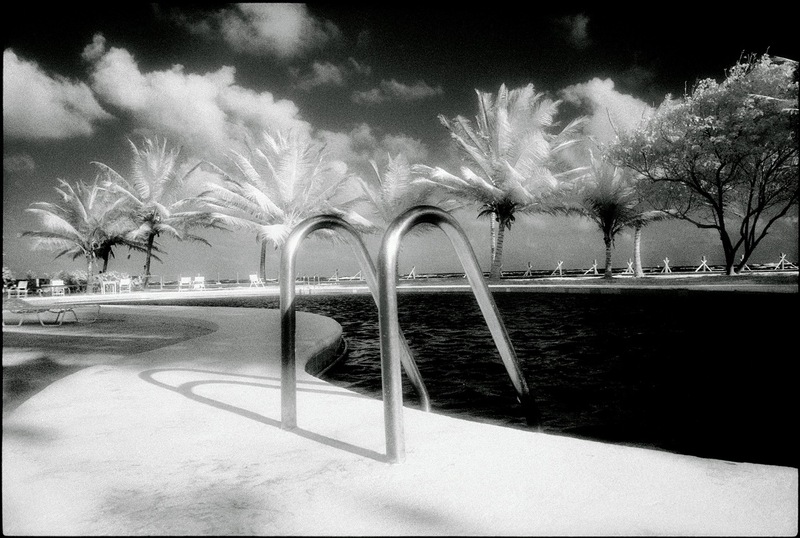 The surreal dream-like quality of the infrared photograph reminds me there may be a better place. Even though the image is not in full color it still gives me warmth and hope that warmer, sunnier days are just around the corner. The pool ladder invites me in, I hear the palm trees rustling as I float on my back and I enjoy having the pool all to myself. The image is very inspirational on a cold, ugly Winter day. Charlie Conn is Adjunct Faculty in Design at Lesley University’s Lesley Art + Design, and is Principal of iconn Brand Architecture.